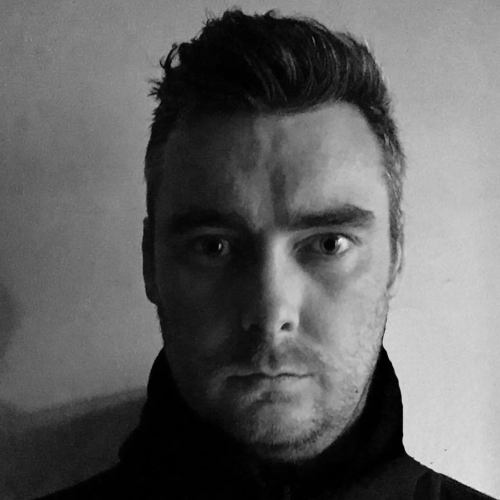 ­­Kenny Campbell is a DJ and producer from Glasgow, Scotland and is one half of crazy techno mentalists Bone Skippers. His sound pushes into the realms of hard industrial punishment, pulling on nuts acid sounds from the 90’s with distorted kicks and piercing percussion. Having embraced the harder side of electronic music upon discovering Mescalinum United’s “We Have Arrived” in 1991, Kenny started collecting early Rotterdam and Industrial Strength records. Inspired by DJ’s like Lenny Dee, Producer and DJ Ruffneck, he bought a set of turntables and soon found himself playing regularly in the local under 18’s club but was constantly being asked to stop …………….. playing too fast and hard. In 2015 he joined forces with Huck Farper to form Bone Skippers, a production duo with no musical restrictions. With very similar tastes and resentment for bland, boring techno, they embarked on a dual mission to create industrial mayhem. The mighty Paul Birken and iFormat amongst others have remixed them and in turn they’ve been remixing artists including Matt tdK and Noach. Individually and as Bone Skippers, he’s released on many labels including Club Poison, Monolith and RIOT Radio Records. In 2017 he launched Pitch Dark Records with Alex Mullen, a label oriented towards dark, industrial and EBM sounds. It was well received and in little under a year they unleashed amazing releases from heavyweights such as Mickey Nox, 14anger and Dep Affect amongst others and have been on the play lists of many big acts including Rebekah, Perc and Dax J. As well as being co-resident at the steam pit of a club ‘DrØne’ in Manchester which books artists including The Horrorist, Blush Response and Front 242, he also hosts ‘Industrial Wasteland’ on Fnoob Techno Radio showcasing both certified and new artists, and appearing on many other established transmissions himself. With a gig calendar permanently full of bookings all over the world for his very noisy live sets and DJing skills, it’s safe to say the masses that journey to witness this industrial techno onslaught will be fully converted to his dark side.